Yesterday was a good book day, as I received books from two, undisputed genre masters. First I received my pre-ordered copy of The Fall of Gondolin by J. R. R. Tolkien. As soon as I got it out of the package, I removed the dust jacket and put it in a Brodart ‘Just-a-Fold’ book jacket protector. I first discovered these back when I worked at a rare and used book store in Chapel Hill, and have been using them for my most treasured books ever since. They are a bit fiddly to apply, but otherwise, I can’t recommend them highly enough. I’ve only had a quick flip through the book, but it looks good. It’s 300 pages, of which the ‘original tale’ takes up about 80. The rest of the book covers the writing, evolution, and related bits of the story, including pieces of other and earlier versions. The book also includes several new paintings by Alan Lee – including ‘Glorfidel and the Balrog'! Though my favourite is the one repeated on the back cover, ‘Ulmo Appears Before Tuor’. A few hours after that arrived, I also received a package containing The Call of Cthulhu from The Pulps Library series from PS Publishing. This slender volume (approx. 120 pages) contains the full text of H. P. Lovecraft’s master work, ‘The Call of Cthulhu’, along with an introduction by Lovecraft scholar S. T. Joshi as well as several associated essays by other well-known names in the field. The book is liberally illustrated by Pete Von Scholly. It’s part of a series that appears to be covering all of Lovecraft's tales in individual volumes. Intriguing, to say the least. A month ago, I was having an email discussion with an old friend about modern Lovecraftian writers, and he strongly suggested I check out Lovecraft Country by Matt Ruff. Well, I’ve just finished it, and it is a fantastic piece of writing. The main characters in the book are a strong, interesting, and diverse lot, and even the antagonist is memorable and intriguing, if not overly sympathetic. I have two minor complaints about the book. The biggest one is that after such a strong narrative, the ending comes off a bit flat. It’s a little easy and lacks a real crescendo. The other is that, despite its title, it isn’t really Lovecraftian. It certainly borrows a few elements, mostly early in the novel, but actually lacks any kind of Lovecraftian tone. This doesn’t bother me much, but might annoy some people who come looking for a classic Cthulhu Mythos type story. These points aside, the book is a triumph of creativity and writing, and I would recommend it to anyone who likes fantasy or horror. Purity Seal – I’m done with you! For nearly twenty years, a light spray of Citadel ‘Purity Seal’ has been the finishing touch for every figure I have painted. Normally, I would paint about five figures, and then spray them together in a little batch. Every so often, however, something went wrong, and the figures would be ‘frosted’. At worst, this looked like an actual layer of frost covering the miniature, at best it dulled and blurred the colours. It was frustrating when it happened, and there were factors that could lessen the probability of it occurring, but in the main, I just considered it a necessary risk in painting. Well, over the last year or two, it seems that more and more of my figures have been suffering from frosting, and I don’t think I’m the only one. Just google ‘Purity Seal Frosting’ and you’ll see what I mean. Looking for an alternative, I sent an email to Jamie Gordon, who is best known in the wargaming world as the author of Outremer: Faith and Blood, a fun skirmish wargame set in the crusades. Jamie is also responsible for painting the Frostgrave demo figures used by Osprey Publishing. Having recently played with these figures again at GenCon, I was impressed not only by the paint job, but by the sealer. The sealer, whatever it was, seem to really preserve the colours underneath and also appeared to provide a better level of protection than Purity Seal. If you really want to test your paint jobs - use the figures for a weekend full of demo games! Jamie told me that he uses Army Painter ‘Anti-Shine Matt Varnish’ on his figures, so I decided to give it a try. It comes in a little dropper bottle and has to be painted onto the figures. I’ve recently tested it out on a few figures, and I’ve got to say, I’m very pleased with the results. The varnish adds just a tiny bit of shine to the figures, which I think actually enhances my paint jobs, but otherwise doesn’t change the colour at all. Also, it feels like a much stronger level of protection. Just so people don't think this is an anti-Games Workshop post, I am still happily using Citadel Chaos Black primer as the first step in painting all of my miniatures, and very happy with it. 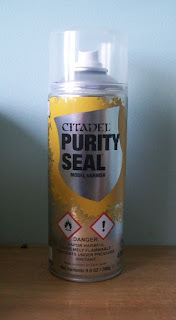 ((Update)) As some readers have pointed out, Games Workshop dropped 'Purity Seal' in favour of 'Munitorm Varnish'. I don't know if this is more than an name change or not. I have used Munitorm a bit and had some of the same problems. So, for now, I'm going to try paint-on varnish, to see if I continue to get better results. Isn't it always the way. In my last post, I presented a list containing everything I've written for the world of Frostgrave, and less than a week later it is out of date. 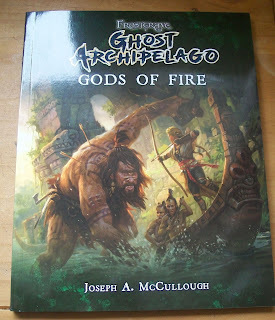 A couple of days ago, I received the new Wargames Illustrated, Issue 371, that contains my mini-campaign The Diamonds of Elias Skull for Ghost Archipelago. The campaign consists of three scenarios, all of which take place on the same island. In the main, it's a classic pirate treasure hunt, filled with traps, monsters, and a fight in a cave behind a waterfall! So, if you are looking for some more action for your Heritor, and a chance to pick up a unique treasure, check it out. 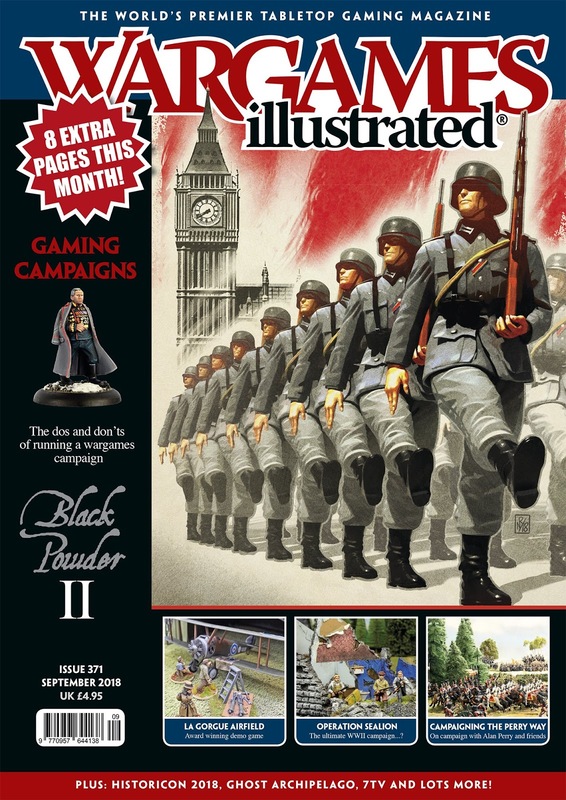 There are several other interesting things in the issue, including a long article on the new edition of Black Powder, featuring lots of shots of John Stallard's game room, where I was once lucky enough to play a game of Black Powder. Also included is an article about the complex campaign run by one of the Perry brothers - who wouldn't want to play in that! 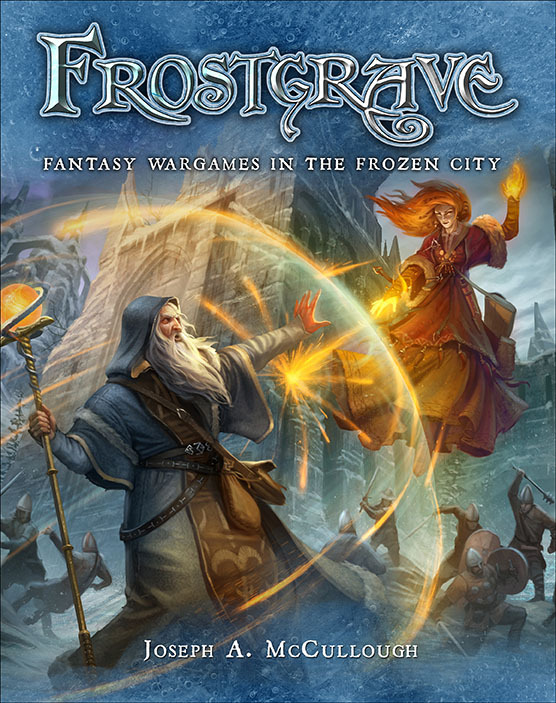 After nearly four years of continuously working on the world of Frostgrave, there is a lot of stuff out there. To help those who might be a bit confused, or fear they might be missing something, I have compiled this list, which I believe contains everything I have worked on that is currently available. (Please let me know if you seen something I have missed). This list is always available on this blog by clicking on the Frostgrave tab in the bar above. I will do my best to keep it up to date! Frostgrave: The Frostgrave Folio (Rules for Captains, A solo/co-op campaign, a couple other campaigns). Look what just landed on my desk! It’s an advance copy of Ghost Archipelago: Gods of Fire, due for release next month. The first thing that is noticeable about this supplement is its size. At 96 pages, it is significantly longer than the previous supplement, Lost Colossus. I suppose I should know, since I wrote nearly 50% more words for this one. This is actually going to be the size of all of the Frostgrave supplements going forward. Personally, I find it much more satisfying, not just because it is a thicker book, but because it gives me a lot more room to play around with things and include fun stuff. For example, a large section of this book is devoted to creating different groups of Tribals. This centres around a long list of positive and negative attributes, that include everything form armour weavers and death worshipers to poor tool makers and herb addictions. Using this system of attributes, there are hundreds of distinct tribes that can be created, each with their own unique rules. This is especially important because Tribals play a much greater role in the scenarios in this book than has previously been the case for any group. Some of the scenarios are played twice, with one side bringing their Heritor and the other bringing a Tribal warband. Other scenarios are a more traditional player vs. player, but with each player bringing some Tribal allies. In each case, players can create their own tribe when fielding these troops (or just use one of the sample tribes provided). I also wrote a few new rules concerning small boats, including capsizing, using canoes instead of small boats, and for mounting a ‘swivelbow’ in your small boat. Oh yeah, who doesn’t want a swivelbow! The new scenarios are bunched into three campaigns, one with two scenarios, one with three, and one with five, and as mentioned previously, a couple of those should be played twice. So, plenty of adventure found in these pages. Finally the book includes new treasures and new monsters, including rules for the Kraken! (Am I the only one who thinks ‘Kraken’ should always be capitalized, even if it is one of many and not a unique monster?). As you may, or may not, have heard, Osprey Games and North Star will also be producing a set of plastic Tribals to accompany the book. I’m not sure of the exact release date on those, but I have seen a mock-up of the sprue and can confirm that it contains optional masks for all of the figures!